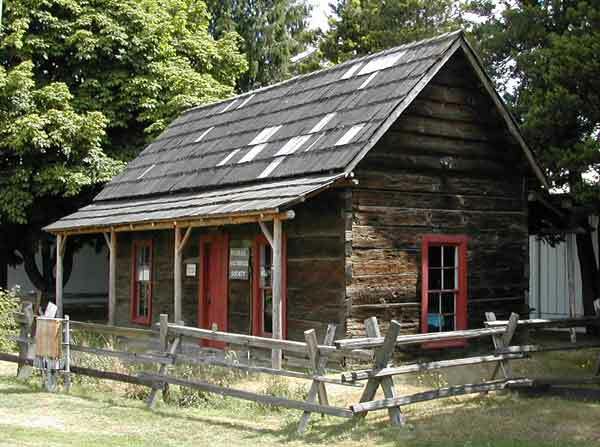 This pioneer cabin from south of Monroe was built in 1887 by John Shannahan and was moved to the Evergreen State Fairgrounds in 1966. Each year during the fair, the Monroe Historical Society hosts thousands of visitors who come to see the cabin and its historical displays. In 1887, 24-year-old John Shannahan built a small cabin on the west side of the Snoqualmie River near the King County line in the Mount Forest District with logs that were hand-hewn using a broad axe. Almost a decade earlier, Shannahan had left his home in Seaforth, Ontario, at the age of fifteen to work in the Michigan Woods. Taking a variety of jobs, he continued to work his way west and arrived in Portland on the first Pullman car of the Northern Pacific Railway in 1883. At that time, the cars had to be ferried across the Columbia River at Kalama before continuing on to Tacoma. Shannahan continued north to the Tualco Valley area and that first year in Washington ran Charles Taylor’s hop house. The following year, he did the same thing for Robert Smallman, and five years later in December 1889, he married Smallman’s daughter Elizabeth, then 23, although her family disapproved of the marriage because of Shannahan’s Irish-Catholic heritage. As the couple began having children, they expanded the cabin and added a wood floor. The first six of their eight children were born in the cabin before they moved back to the Tualco Valley in 1904 and sold the cabin. It was occupied by laborers and renters for a few more years and then abandoned in 1912. In 1936, their daughter Blanche had the cabin moved by team and wagon to her property in the Tualco Valley. The bottom logs had decayed and were removed thereby lowering the windows and doors. In 1923, Elizabeth was diagonsed with diabetes and for the next six years she self-administered insulin before her death in December 1929. John lived until 1936 and was buried on Election Day. Besides running his dairy farm, for many years he was also the county road supervisor for District 3. In 1966, the cabin was given to the Evergreen State Fair and moved to its present location in the southwest corner of the fairgrounds. Charles Taylor of Monroe dismantled the entire cabin, carefully numbering all the logs and beams before the move, and then spent months reassembling it. The floor and roof had to be entirely replaced. Taylor handcut new cedar shakes for the roof and chinked the logs with dry moss. Today, the cabin is open to the public during the annual Evergreen State Fair at the end of August when it is hosted by members of the Monroe Historical Society. The artifacts on display, although contemporary, are not original to it. The cabin’s original stove is in the Snohomish County Museum in Everett. However, the sweetbriar rose near the front entrance to the cabin is from a cutting from Lucie Streissguth’s rose, which came from a cutting of the rose that actually grew at the cabin when it was at Mount Forest. Sorry, that is the Siler Logging Company!